Loosen the fruit by giving the branch a rhythmic jiggle! The jiggling is activating the stretch sensors of the muscles and creates room for baby to move. This is a technique that relaxes the muscles more than the birthing person can do by mental relaxation. This can be done with hands or, as traditional to Yucatan (Mexican) Midwives, by wrapping a Rebozo across the buttocks and giving the ends a shake. The labor position can be Standing, Hands-and-knees, Forward-leaning Inversion, or Open-Knee Chest, or more simply, leaning over a counter/dresser or such. Jiggle for about 20 minutes. Listen to the birthing person to make sure your efforts are relaxing! Warning: Never shake your abdomen vigorously. There’s a baby there! Using the Birth ball to rest on while having a Rebozo sifting of the hips (Shake the Apples). 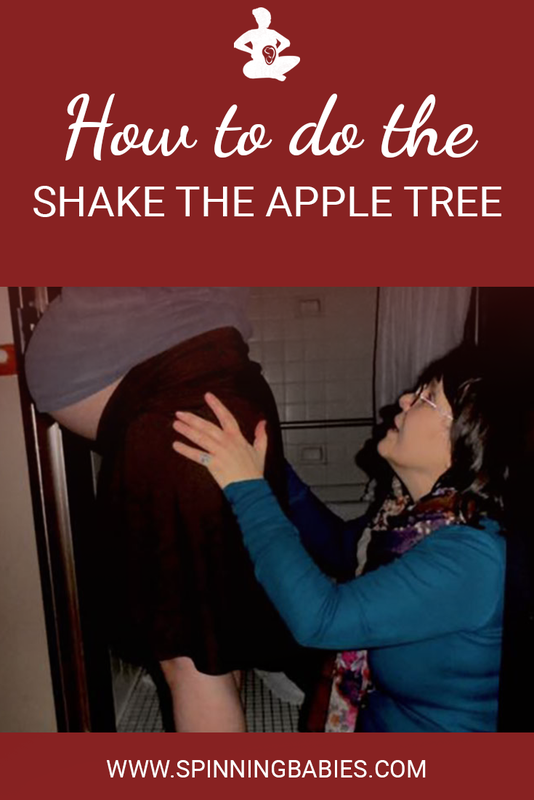 Gail shakes the apples for parents in active labor. It’s so relaxing for the birthing muscles. MT Conference Oaxaca 2002. Partera Angelina Martinez was my influence. And although I learned it from her it was long enough ago where I’m sure I have changed her traditional methods along the way (which matters). As a student I assumed everyone knew how to use a Rebozo. I use it between contractions for at least 3 or for 15 minutes. I’ll use the couch or bed as an incline as well. She was awesome. I’d love to sit with her and learn again knowing what I know now. I’ve never called it anything in particular. Love you Gail! I was taught a technique in my doula training that was called apfel-schtuken (if I remember correctly). Sounds like it might mean “stuck apple” in german. but it was where the mom was on hands-and-knees rocking forward and backwards. as her doula, I was positioned behind her and when she was at the closest point to me in her rocking, I gave both her sitz bones a gentle yet firm “thunk” sending her forward again. It’s a little awkward to do, but I got a baby to get out of a funky position he was lodged into using that technique one time. Sometimes apples need a little help, ya know!